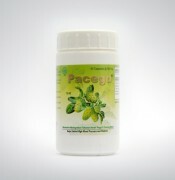 Pacego 60 caps - Effective for hypertension. Launched urination, blood circulation, anti-inflammatory. •Scopoletin function widens blood vessels constrict and the circulation of blood so the heart does not have to work too hard to pump blood. Thus the blood pressure became normal. •Damnacanthal can increase endurance by activating white blood cells work. •Proxeronin body needs to produce Xeronine, who works in the cell body to promote healing, activate proteins that are not active, set the structure and shape of the active cell, and normalize protein in abnormal cells. •Soluble fiber helps normalize blood sugar levels. Helps relieve symptoms of mild high blood pressure. Helps improve the immune system. Take regularly 2 times a day @ 2 capsules. Dosage may be increased up to 4 times per day @ 2 capsules, or adjusted as needed. Only for people with high blood pressure that has been set by physicians. During the use of your doctor on a regular basis.